Social franchising is considered to be a potential solution to the problem of low quality of care available in rural areas in developing countries. The central premise of this business model is to create a large network of health care providers by leveraging the widespread presence of informal sector health care providers in rural areas, with franchisees paying a fee to join the network in exchange for training, standardized protocols, supplies, branding, and marketing from the franchisor. The World Health Partners’ Sky Health program was launched as one the most innovative social franchising programs that incorporated telemedicine technology to enable networked informal sector providers in rural areas with formally trained providers in large urban centers. The WHP program in Bihar was funded by the Bill and Melinda Gates Foundation, and was also the recipient of many global awards for entrepreneurship and innovation including the Skoll Foundation award, World Economic Forum / Schwab Foundation award, Asian award, and many others. 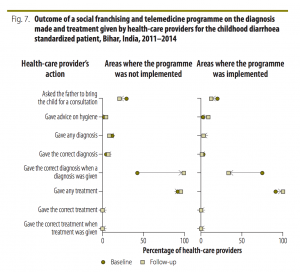 Using data collected at baseline in 2011 and follow-up in 2014, we evaluated the impact of the program using a difference in difference analysis to compare changes in areas where the program was implemented with other areas where the program was not implemented. Our results on the program’s effect on quality of care provided and knowledge of healthcare providers show that the program had no impact on quality of care or provider knowledge. Previous PostPrevious What do we think we are doing? Can a clinical information network improve pediatric care practices in Kenya?